Everyone loves a love legend, and more so if it has tragic overtones with lovers dying young. Why go all the way to Verona in Italy to find an example? Our own country has legendary loves aplenty. Punjab, of course, takes the cake with Heer-Ranjha, Sohni-Mahiwal and Mirza-Sahiban. It was said that Sahiban’s betrayal of Mirza, if at all it was a betrayal, that led to his being killed by her brothers cast a curse on the land of the five rivers and there was a full stop to romance of the kind for all times. But when was there a curse that could not be turned into a boon? We have seen it happen in our times, right in our midst. 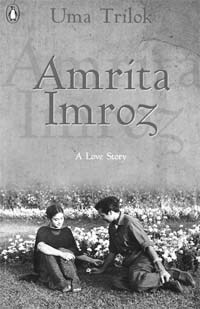 Amrita Pritam, the celebrated poet of Punjab, and her painter partner, Imroz, by sharing a lifetime of love and friendship, drove the curse away and the tragedy that accompanied romance in yore was turned to fulfilment in present times. Imroz who pens verses still to his lady love who passed away last year on October 31 shows that even death could not do them part. It can be called a contemporary love legend and in times when love is so rare, Penguin India thought it fit to bind in a book memoirs woven with the poems, paintings and photos of the two penned by Uma Trilok, a writer of Hindi. The book is a quickie, but the genuineness of the experience makes up for its sketchiness. Uma Trilok, who says that she was an admirer of Amrita since childhood and had sung her songs while still at school, gets to meet her in 1996 when Amrita had already taken ill. Being a Reiki and Paranik healer, the writer formed close ties with Amrita and Imroz and the outcome is this volume that cannot be faulted on its sincerity. Much has been written on Amrita and Amrita wrote much on Imroz, but Trilok speaks to Imroz and brings him out of the shadow. The writer asks Imroz, "Amrita lived with the memory of Sahir, did it bother you?" Imroz says: "No. I accepted it. There is no hassle when one loves without ego, without argument, without making artificial arrangements, and without calculations." Trilok while stretching her association with these legendary lovers into 128 pages often talks of the mundane and everyday but then that is the most important part of a relationship that can retain its freshness season after season. The parting captures the chemistry the kindred souls shared: "At the end of the deserted cremation ground, a few people were standing, silently staring at the burning pyre. Away from everybody, alone, standing in a corner, I spotted Imroz. Going close to him and touching his shoulder from behind, I muttered, "Don’t be sad." Somehow I always felt that Imroz would become very sad after Amrita’s death. He turned, and looking at me, said, "Uma, why be sad? What I could not do, Nature did." This was said so because the last of Amrita’s years had been painful and death came to set her soul free from a withered body. A sentiment has the danger of being reduced to sentimentality and it is Imroz with his folk wisdom, a man any woman would yearn for, who steers the book clear of such a fate.